hoorai 蓬莱 Buddhist mountain Horai in China, where people would live forever. Horaisan 蓬莱山, Horaijima 蓬莱島, a mythical mountain or island of eternal youth. Because in Hōrai there is no knowledge of great evil, the hearts of the people never grow old. And, by reason of being always young in heart, the people of Hōrai smile from birth until death, except when the Gods send sorrow among them; and faces are then veiled until the sorrow goes away. All folk in Hōrai love and trust each other, as if all were members of a single household; and the speech of the women is like birds singing, because their hearts are as light as the souls of birds; and the swaying of the sleeves of the maidens at play seems like the fluttering of wide, soft wings. In Hōrai nothing is hidden but grief, because there is no reason for shame; and nothing is locked away, because there could not be any theft; and by night as well as by day all doors remain unbarred, because there is no reason for fear. And because the people are fairies, though mortal, all things in Hōrai, except the palace of the Dragon King, are small and quaint and strange; and these fairy-folk really do eat their rice out of very, very small bowls, and drink their wine out of very, very small cups. Kadomatsu are placed in front of houses to welcome the New Year deity, purify the entrance and drive demons and evil spirits out. Originally, they were made from evergreen woods such as pine, cedar, beech and sakaki. But the prevalence of the use of pine has led to their naming as 'kadomatsu' ('gate pine'). 'Pine lasts for 1000 years and bamboo for 10,000 years' is an old Japanese proverb. 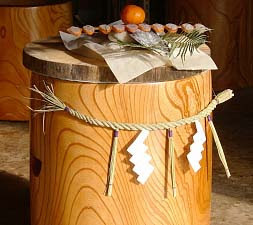 Pine and bamboo are popular materials for kadomatsu because people wish that Yorishiro, the place in which the deity lives, will last forever. According to custom, kadomatsu should not be set up on 31st December. This is because it is not faithful to have only one day before welcoming the deity on New Year's Day. Moreover, the 29th should also be avoided because 'nine matsu' is the same pronunciation as 'wait for pain'. 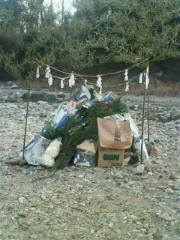 Usually, kadomatsu are set up by the 28th.
. toshitokujin 歳德神 the New Year Deity . 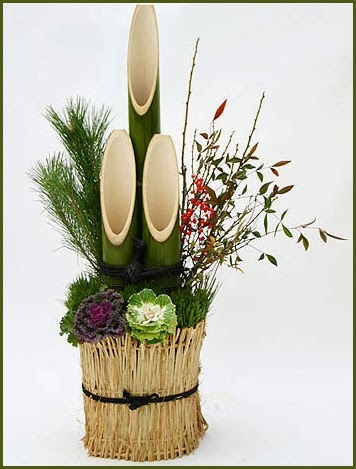 Why is the bamboo (take) of the kadomatsu (matsu) cut slant? The story goes back to the two famous warlords, Matsudaira (later Tokugawa Ieyasu) and Takeda Shingen, the matsu and take rivals. At the battle of Mikatagahara in 1573, Takeda defeated Matsudaira, who had to run away in a humiliating retreat to survive. He was so angry at his adversary, that at the new year he cut the bamboo of the New Year decoration in a way he would cut the head off his adversary. As time passed, Matsudaira won more battles, changed his name to Tokugawa and eventually became the first Shogun of the Tokugawa Bakufu government. 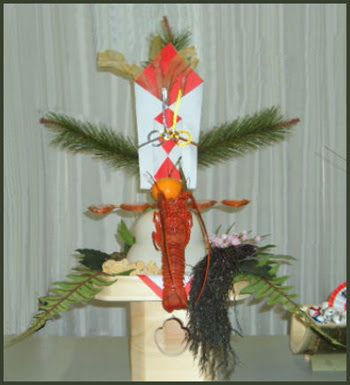 Live lobsters or ornaments made from paper or string are used. The wooden mortar for pounding glutionous rice for mochi is honored.
. usu 臼 different types of mortars, grinders and handmills . KOBU, yorokobu, is a play on words with "happiness" and "good luck". 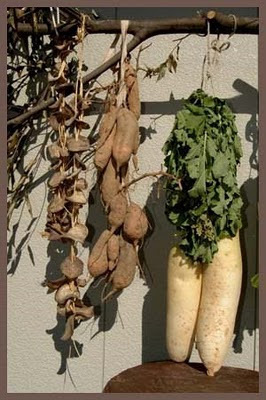 saiwaigi 幸木 (さいわいぎ) "lucky pole"
A pole hung in the garden, decorated with fish, radish and other food items as offerings to the deities. 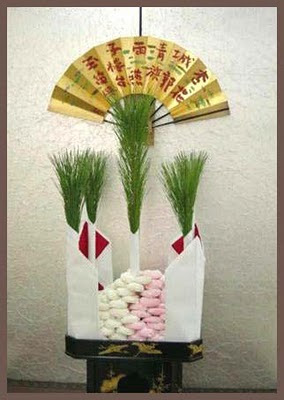 They are the "three friends of winter" from ancient China. tachibana is an old name for the mikan. 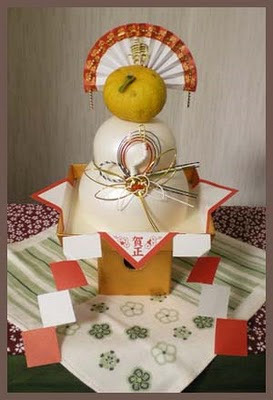 The first mikan tree is said to be in the temple Tachibanadera 橘寺 in Asuka, Nara. Sometimes it starts to take root and its branches can be used for years to make new decorations. The year's first good news. This was most probably the New Year greeting poem to be published soon. 1694 is the last year in the life of Basho, he died in winter of this year. In his wandering mind, he envisaged an auspicious trip to Ise. Hôrai (hoorai) is a mythical island of eternal youth. On New Year's Day offerings are set on a special table in its honor. Literally, miyo no matsu signifies "reign's pine." Issa is referring to a rather cheap pine decoration on the table in honor of the new imperial year. They used to come to the Year End Markets or nowadays stand aroung big train stations. At court and in the garden of rich people, they make a mountain of snow in imitation of Mount Horai. If there was not enough snow, they would go borrow more from the temples in the neighbourhood. This custom has been made into a poem already in the Makura Soshi collection. Take a look at my visit. The mountain village of Nagao in the province of Yamato is not so far from the capital and thus not quite a typical "mountain village" . . . It has the atmosphere of the "Holy Horai Mountain" of ancient China. The home in the estate of the venerable Honda Tadakatsu 本多忠勝 (1548 – 1610) had a fire on the first day of the New Year. 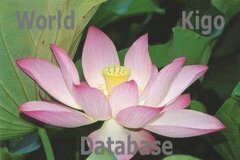 The mansion had been built with the Kimon in mind. Just before the fire started, the pine decoration at the front gate showed a broken branch and three broken bamboo sticks.